Almost mid-way through our Secret London photo walk, we came upon an area of such decay and ruin that it was quite a contrast to the exquisite sights we had seen on the first half of our walk. Naturally, I fell in love with this area with its burned-out shells of buildings and boarded-up shops. 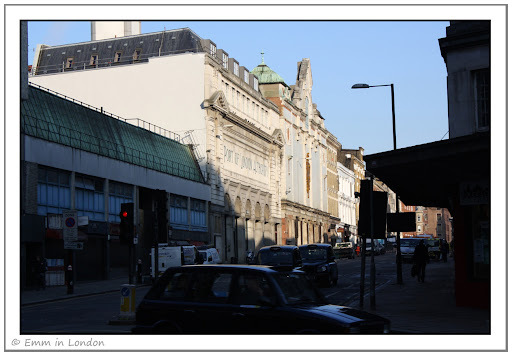 This is the Fish Market and Red House, the former cold store of the Smithfield Market. Like the General Market next to it, this complex is in danger of demolition. The Fish Market was built in 1888 and the Red House was built between 1898 and 1899 and is a wonderful example of Victorian architecture. This is one of my favourite photos as I love the upwards elevation. There had obviously been a fire in the building at some stage and it was incredible to see such a grand old building in such a state of disrepair. I can imagine it must have been quite impressive in Victorian times but at the moment, the very fabric of the building seems to have fallen victim to time, neglect, fire and ruin. The Red House building has been given Grade II listed status as it is the "the earliest existing example of a purpose-built powered cold store". That means that out of all the building in the complex, it is the only one that might be saved from greedy developers. The plaque at the corner of the Fish Market. This is the exquisite and intricately detailed circular corner of the General Market, a building almost certainly destined for demolition. We rounded the corner and walked up the road to discover the strangest sight we had seen all day. Any one who has seen the lurid display of 1970s architecture in downtown Johannesburg and Hillbrow will be quite familiar with concrete monstrosities such as these. It was just unusual to see them in London! Hillbrow, corner Plein and Twist Streets? No, this is London! (See: Johannesburg landmarks for a few examples). Our final photo opportunity before exiting this intriguing part of London was the old Port of London Authority building on Charterhouse Street. 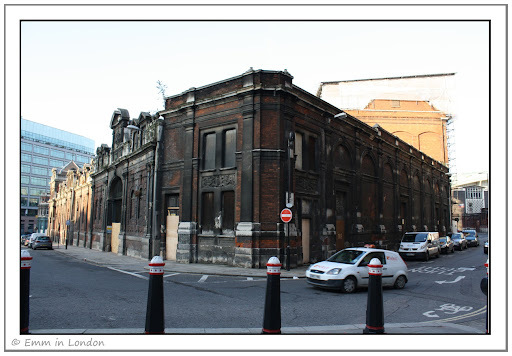 Next to the Port of London Authority Building is the Central Cold Store which is used as a power station now. How the mighty have fallen. Actually, how the mighty did fall: Wikipedia says that “Smithfield has a bloody history of executions of heretics and political opponents, including major historical figures such as Scottish patriot William Wallace, the leader of the Peasants' Revolt Wat Tyler and a long series of religious reformers and dissenters”. Very interesting! Wow, reminds me of my trip a long time ago. Seemed ancient but only a few years. 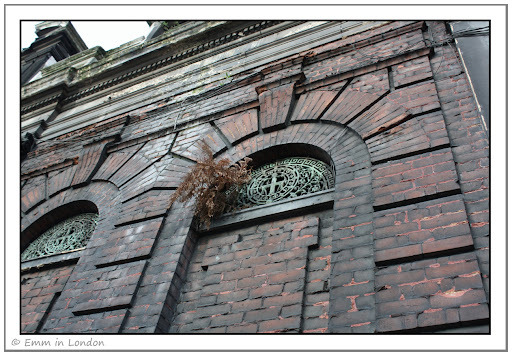 The old buildings have such great details and character, it's so awesome to see. What beautiful old buildings. I do love trying to imagine their past lives. Very interesting indeed! excellent work, Emm. your secret photo tour looks so fun. there was a film in the states called "The Lake House" with Keanu Reeves and Sandy Bullock. In it, there's this terrific architectural tour (walk) that they go on. lovely. I love Victorian marketplaces in the heart of Greater London and must spend much more time thinking about the clever architecture. Do you have a contemporary photo of Fish Market and Red House eg from the 1890s? What a pity! Sad to see those magnificent buildings left vacant and not properly maintained. And thanks so much for your so interesting comments on my blog. 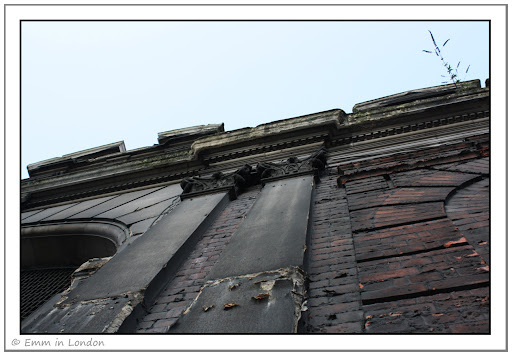 i like the perspective of the first shot but it's a pity that the old buildings couldn't be saved. Old buildings have their own style and charm. I wished they all can be restored instead of torn down. The inside of the market must be something to see. If only they could let people in to photograph the place before it's demolished. 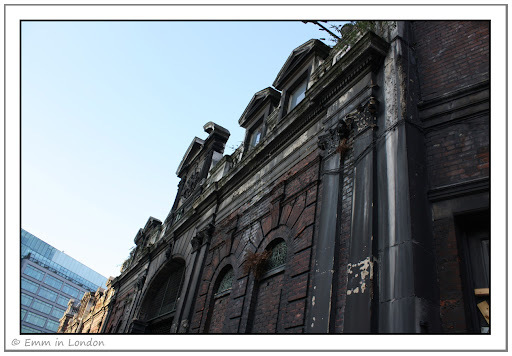 It's sad to see such historic building being left unused, deteriorating and finally abandoned. To its west, we have modern office blocks; towards north, seedy King's Croos; South, arty South Bank; East, bustling Bank. Did you visit the Saatchi Gallery today? Best thing to do when the weather was so rubbish like today. Lovely :) nice narrative... felt I was part of this London walk! How beautiful old buildings in London. I can't imagine the old buildings contrast to the fashion ones just in the same street. Nice shot! BTW, welcome to Taipei. Hope see you here soon. Really interesting photos! I really like the one of the corner of the General Market building. The old buildings look like something out of a Dicken's novel. Truly! Isn't there a historical society who can help with this? And one other thought, maybe it's ignored because London (and Britain in general) has a plethora of old structures, much older than this one? To answer your question about bookstores, I believe Borders is the largest chain so far which has fallen in recent years. Independent bookstores have been dying out for the last decade. Interestingly, those bookstores which develop e-businesses, have excellent customer service, good sales, and create an experience for shoppers are surviving. the last time i was in england, it was purely a tourist trip, next trip i make sure a traveler trip, i will find out every little corner! Emm..wow...gorgeous...your pictures of the old Victorian building stole my heart..such a cool vibe and feel to it all..I loved especially #3 ..they are all gorgeous..how id love to see such beauty ..you are lucky! I think I was meant to love in another time..i always enjoy the gorgeous architecture you share here! Isn't it a shame that economics dictate it's better to tear down old buildings than to retrofit them to new uses? Fantastic photos Emm! It's a shame about the state of the Fish Market, but as you say it must have been very impressive in Victorian times. A real shame the older buildings to be demolished. The architecture is historic and deserves preservation. Sad ti see more big boxy unflattering buildings take their place. Great buildings and so are your photos. I like the angle of some them very much. Ps: I do not think you can hear the Northern Light..the only voice I hear in my head is, shoot, shoot! :-) because of the long exposure, and that light it changes so fast, I get stressed. "bones" of their structures. Your photos and your words a such a loving tribute to these beauties. I want more for these buildings - an update, and restructuring and people coming and going and just being in them. Thank you for this tour! I'm surprised these buildings haven't been torn down yet to make way for some ugly triangular modern distraction. Loads of history in this quarter. There is an early morning walk if you want to learn more about the area. Hey all! It's just me again with my late replies. I am sure that worm holes open when I am busy with my financial month end as I always seem to lose a couple of weeks. @ Self Sagacity: it will be a shame and I think London needs to be careful of losing all of its character. @ JaPRA: Me too! I love to imagine what London must have been like centuries ago! @ JG: It was a load of fun! 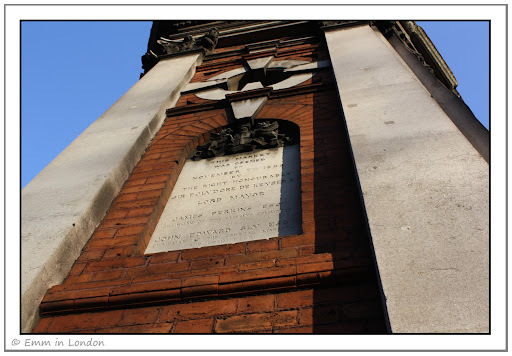 London is so full of history! @ Hels: No, unfortunately not. Only what they have on Wikipedia. @ Betty: Heh, quite apart from not being properly maintained, they are just about abandoned! @ Life Rambling: I know. Maybe they'll be successful in saving the sites but I really don't see them restoring the buildings to their former glory. @ AVCr8teur: I know, I totally agree. I'm not sure I could bear to see the inside though - it would be heartbreaking. @ London Caller: I know! That whole neighbourhood is affected. I haven't been to Saatchi yet. I haven't done much as I've been struggling with a bad back! @ Ash: Great! That was the intention. @ Ellen: Is everything relatively new in Taipei? @ Karen: Yeah, that is one of my favourites too. @ Cassandra: There are a host of societies working to save the buildings but they can only save the ones that are unique or represent the first example of a certain architectural style or something. @ Lily: I honestly think tourism is under-rated but I enjoy these secret little tours now that I have come to learn more about London. @ Kiki: Thank you! Three was a favourite of mine too. @ Kathy: Agreed. Although, I am unsure I'd be much happier if they set up snazzy apartments here. @ Alan: Thank you! It must have been quite grand. @ Rob: Definitely. I know we can't save everything but surely such beautiful buildings shouldn't be left to ruin? @ Spiderdama: Thank you! I was certainly trying to play around with the angles. @ Marion: Thank you and thank you for coming on this tour! @ Mommy: Thank you! 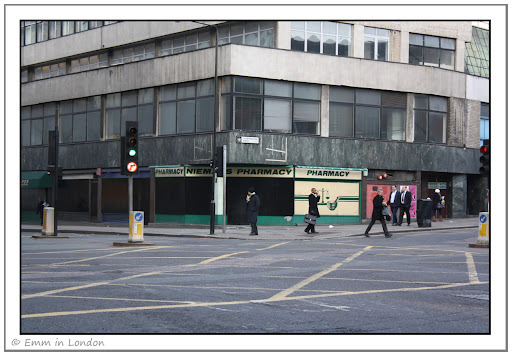 I hope to show you more of secret London. @ Mo: I definitely want to go on one of those walks soon. @ William: Well, the building was burnt out! It reminded me of how a nightclub moved location in Johannesburg and then mysteriously, the old building burned down.